If you asked me what is one of the rarest animals on Shamwari that you have only seen once or twice, the aardwolf would definitely come to mind. The last time I saw one was a year ago and at first glance I actually thought it was a black-backed jackal as it had the same body shape. But I quickly realised this was not a jackal at all but the strange insect eating creature called the Aardwolf. The name Aardwolf is an Afrikaans name which directly translated into English means “Earth wolf”. 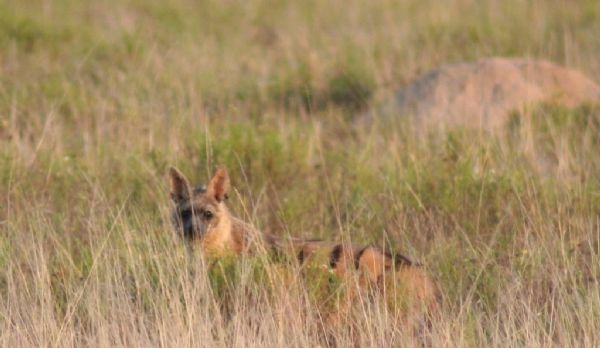 They mainly eat termites and a single aardwolf can eat about 200 000 termites in one night by opening up termite mounds with its strong claws and licking them up with its sticky tongue. Imagine you eating termites for a living! During the day they will sleep in burrows that might be in a dug up termite mound or an old warthog or porcupine hole. They are nocturnal which means they are more active at night time and also do most of their scent marking during this time by pasting smelly secretions onto grass stalks or tree stumps. They are highly territorial, defending their area with noisy fighting if an intruder dares to cross the line.